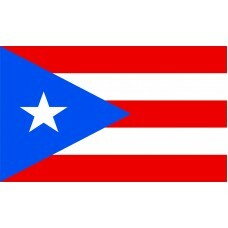 The Puerto Rico Flag features five horizontal bands in alternating red and white colors and at the left of the flag, is a blue triangle, pointing towards the center of the flag. The blue triangle contains a white 5-pointed star. The red color represents blood and the "blood that nourishes the three branches of its government – Legislative, Executive, and Judiciary" The white color represents the country's freedom and liberty and the blue color represents the sky and water of the country. The blue triangle represents the "Republican Government" and the white star represents "The Commonwealth of Puerto Rico." The Puerto Rico Flag that is used today is an adaptation of the flag that was designed in 1895 and first flown in 1897 during the "Yauco Revolt," which was Puerto Rico’s second revolt against Spain. The first Puerto Rico Flag was created in 1868 and featured four rectangles (still with the red, white and blue colors) and was flown at "Grito De Lares," which was Puerto Rico's first revolt against Spain. Between 1492-1898, Puerto Rico were not permitted to fly their own flag and had to fly the flag of Spain and between 1898-1952, they had to fly the flag of the USA. 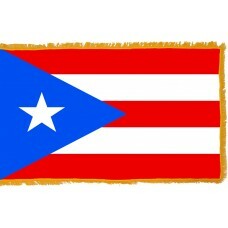 The Puerto Rico flag used today was officially adopted in 1952. Puerto Rico (which is also referred to as Land of the valiant Lord) is an island nation in the Caribbean Sea and it is a territory of the USA. The largest city and capital is called San Juan, which is also the second oldest city in America. Puerto Rico was first discovered in 1493 by Christopher Columbus, who claimed it for the Spanish. He also named the island "San Juan Bautista" after John the Baptist. Spain had control over Puerto Rico for over 400 years and endured many invasions by the French, Dutch, and British. In 1898, as a result of the Spanish-American war, America gained control over Puerto Rico which still exists today. Puerto Rico's economy is mainly reliant on manufacturing, technology, and tourism. It is home to some of the best beaches in the world and the capital, San Juan, attracts over five million tourists a year. One of the main attractions is the "Salta De Dona Juana" which is a 100ft waterfall with crystal clear waters. Another main attraction is the San Juan historic site which is home to forts, bastions, powder houses, and the old city wall. The old city of San Juan is a 465 year old neighborhood where the streets are paved with blue cobbles and is very popular, not only for its history, but also for its beaches, casinos, and climate. "La Fortaleza" which dates back to 1533, is the residence of the Governor of Puerto Rico and is the oldest executive mansion in the new world.